Since twelve years of blogging, I have tried many recipes following the recipes posted in blogs. Very few times the end result ended up in garbage but many a times it was licked clean from plates, spoons and even the serving bowl. When I think of those recipes which have become my family favourites, I realised I haven’t posted most of them. So with this new mission of mine, I will be posting all the recipes I had tried and tested from bloggers and most importantly, loved by my family will be posted under the tag called Recipes from Your Kitchen to Mine. One of the recipes in this series which is loved by everyone whenever I have served it is from lovely, sweet and chatter box (sorry couldn’t help it;) Swati who blogs at Chatkhor. 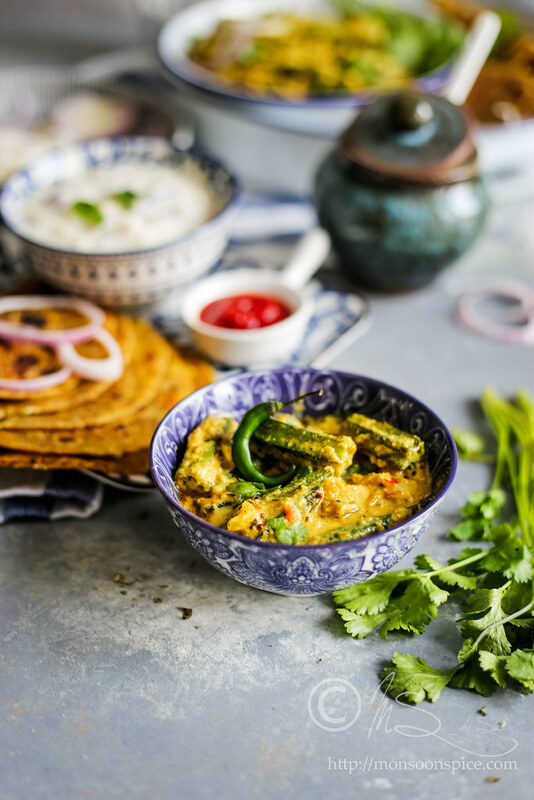 This Hyderabadi Dahi Bhindi Masala is Swati's aunt's recipe which she blogged few years ago and being big time Okra lovers, it didn’t take too long for us try it. When I first tried the recipe I was a novice cook who had most kitchen disasters when it came to yogurt based curries. I was curious as how creamy the yogurt gravy looked as most of the times when yogurt added in a curry ended up curdling with unpleasant texture and taste. My only solution to this problem was to add yogurt just before switching off the flame. But in Swati’s recipe, she used a paste made using cashews soaked in milk and coconut and Bingo, I got fool proof recipe for getting creamy yogurt gravy without curdling it. Both cashews and coconut are used in many recipes to thicken the gravy, giving it a creamy texture and also to enhance its taste. The amount of cashew and coconut used in this gravy is comparatively quite small without overpowering the actual yogurt based gravy. This cashew-coconut paste is just enough to give creamy gravy without you worrying too much about the calorie. Another intersecting tip was sprinkle little salt on okra pieces and marinate for few minutes before frying. I was not sure about the reason behind it till I decided to give it a try and realised it actually helps in reducing the sliminess of okra. With few modifications to suit our taste, this recipe is a keeper. Thanks dear Swati for sharing this delicious recipe with us which has become one of our favourite yogurt based curry. 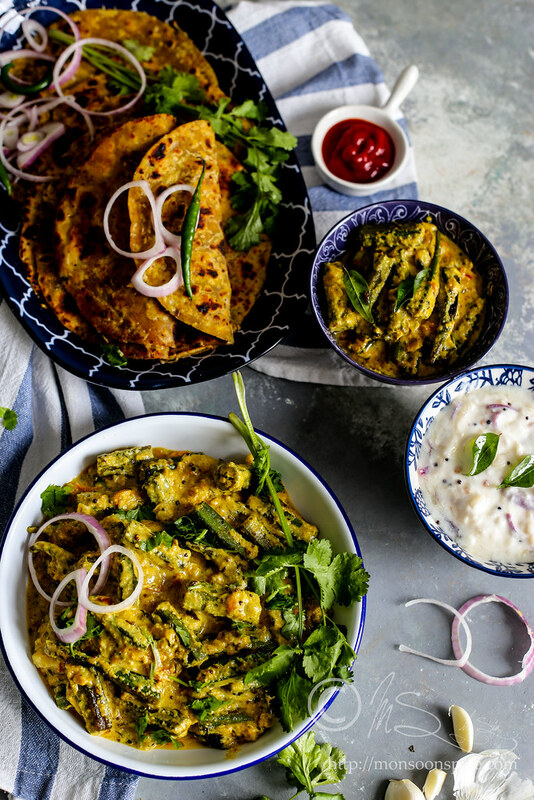 So, listen all you okra/bhindi lovers, this is one recipe you MUST try! 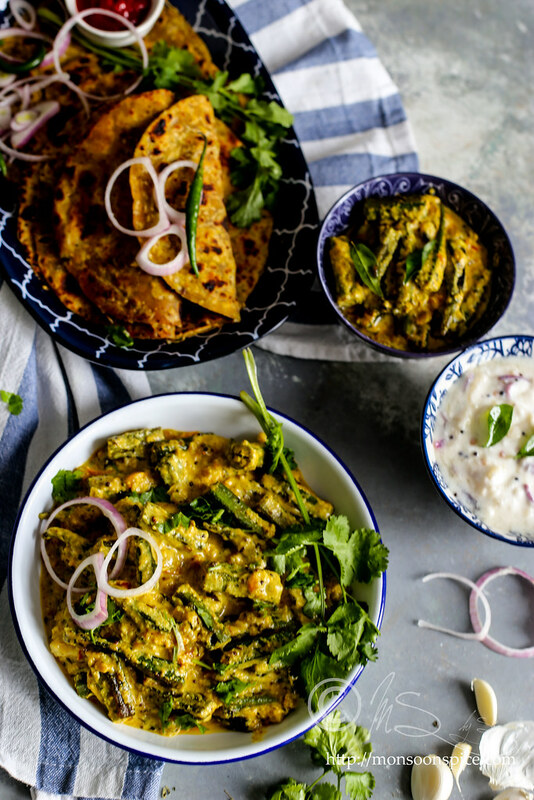 Creamy, subtly spiced and finger licking good Hyderabadi Dahi Bhindi Masala is pure decadence and joy with every mouthful! 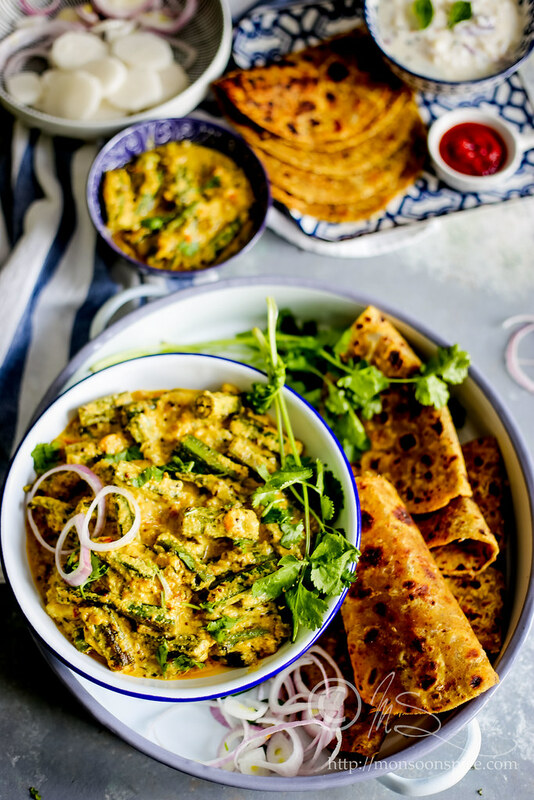 The spices used are very little, just enough to give it a touch of warmth without being overly spicy and while curry leaves in crunchy tadka imparts wonderful aroma to the dish, the pleasantly bitter kasuri methi enhances its flavour. 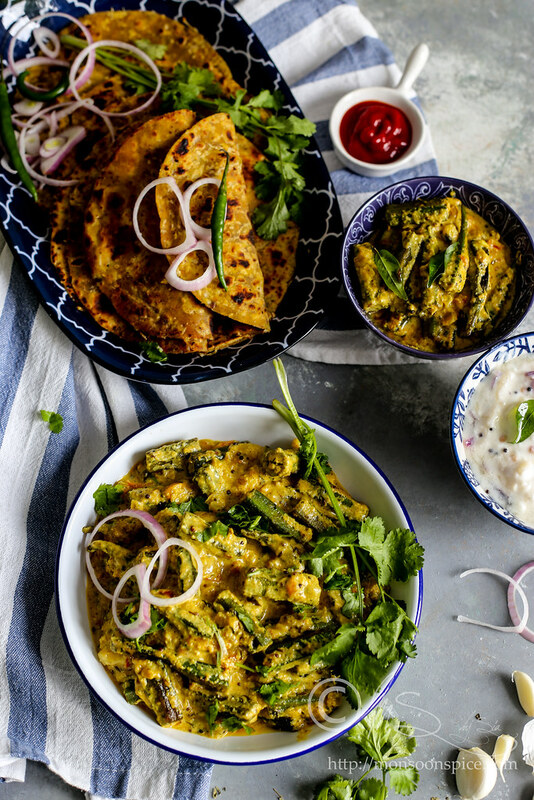 The final result is crispy okra in a mildly spiced, tangy, creamy gravy which is the perfect thing to mop up with some flaky parathas or puffed up warm rotis.Cook this first and you can thank me later! 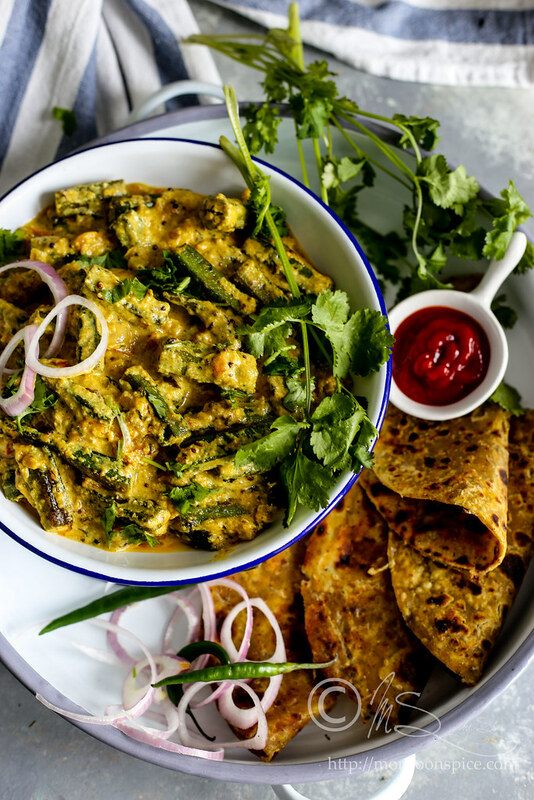 I promise you, this one is finger licking good and if you are a crazy about okra/bhindi like me, you will end up licking the spoon, plate and even the serving bowl! Wash and pat dry the okra. Trim the ends and cut them into 1 inch long pieces. Sprinkle little salt to okra pieces and mix well. Keep it aside for half an hour. This helps in reducing the sliminess while pan frying the okra. This step is optional but recommend. Soak the cashew nuts in warm milk or water for at least 10 minutes. Finely chop the onion and tomatoes and keep them aside. Grind soaked cashews and coconut to smooth paste adding the milk used for soaking. Keep it aside till needed. Heat 2 tbsp of oil in a pan and add okra pieces to it. Fry them continuously at medium to high flame till they turn brown retaining their crispiness, about 7-10 mins. Alternatively you can deep fry them but I prefer pan frying for healthy option. Transfer these fried okras to a plate lined with kitchen/paper towel and keep them aside till needed. Heat 1 tbsp oil in a pan and add mustard seeds to it. When mustard starts to pop and splutter, add cumin seeds, urad dal, dry red chillies, hing and curry leaves and sauté it for a minute till cumin seeds and dal turns golden brown in colour. Now add finely chopped onions and fry till they turn light golden, about 1-2 mins. Add ginger-garlic paste and fry for another minute till their raw smell disappears and onion turns golden brown. Next add all the dry masalas (garam/kitchen king masala, red chilli powder, amchur, turmeric and coriander powder) along with crushed Kasuri Methi and fry for a minute on low heat. Mix in finely chopped tomatoes and sauté till they turn pulpy and release their juice, about 2 minutes. Now add ground cashew-coconut paste and mix well. Keep stirring for a minute. Add yogurt, sugar and salt to taste and stir well. Depending on the consistency of gravy required, add ½-1 cup of water and mix well. Simmer the gravy and let it cook uncovered for another 5 minutes. Mix in fried okra and adjust the seasonings. Add little more water if you think the gravy is too thick and simmer for another 3-5 minutes. Serve this delicious gravy of Hyderabadi Dahi Bhindi Masala with any roties or flavoured Basmati rice and enjoy. Try not to skimp the amount of oil used in this recipe. 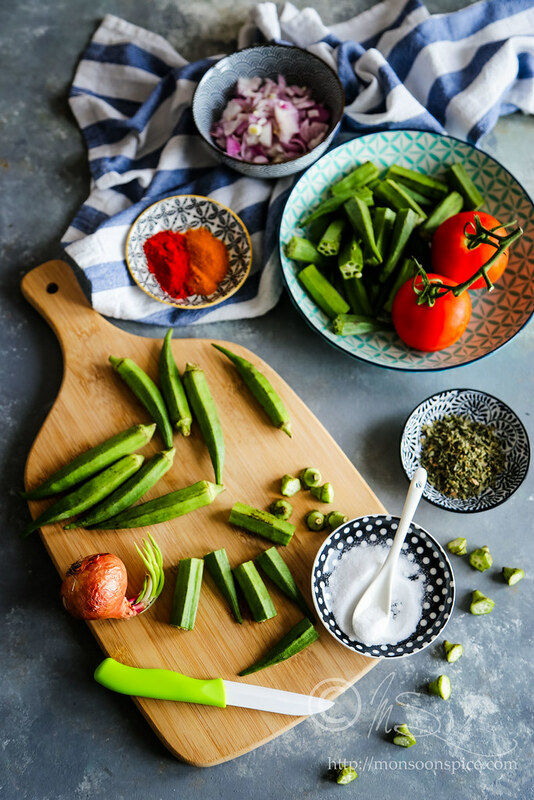 There are couple of things to keep in mind when prepping and cooking with okra. Here are my few handy tips for those who find it difficult to cut and cook this slimy okra or bhindi. Always choose young and tender okras. The best ones are the ones that get easily snapped when you bend the tail end of the pod. Make sure that you dry the okra completely after washing and are moisture free. Either spread them on kitchen towel in single layer and leave it for few hours or pat them dry with dry kitchen towel to remove any moisture. When cutting them, make sure that you use a dry chopping board and knife. Keep some dry kitchen tissues nearby and clean the slime from the knife every now and then while chopping the okra. I had tried stir frying the okra with very little oil and ended up with really slimy okras. So I usually use little extra oil than normal and cook it on a very high heat. This way the okras not only lose their sliminess, but also retain their crunch and that beautiful emerald green colour. 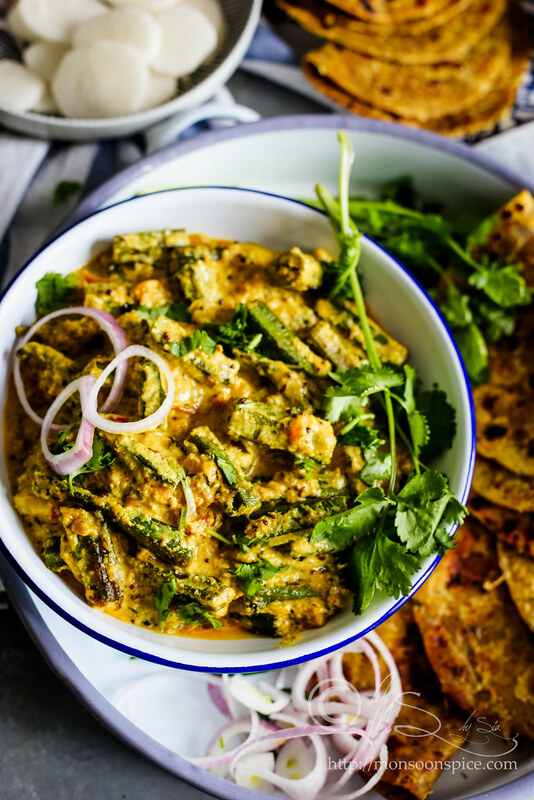 Very interesting recipe.I am happy to try something new like this hyderabadi dahi bhindi masala. Till now i have not had any disasters with the recipes tried from other bloggers. The okra curry looks so tempting even thought i am not a okra fan. Nice new section to add to one's blog. The recipe as well as the photo looks lovely. Must surely give it a try. ah! what a lovely recipe with okhra! looks delicious. Looks delicious & fantastic.. great click.. thxs for sharing..
where r u put up in london? Wonderful recipe.Ur photographs are so inviting. Let me try it sometime. 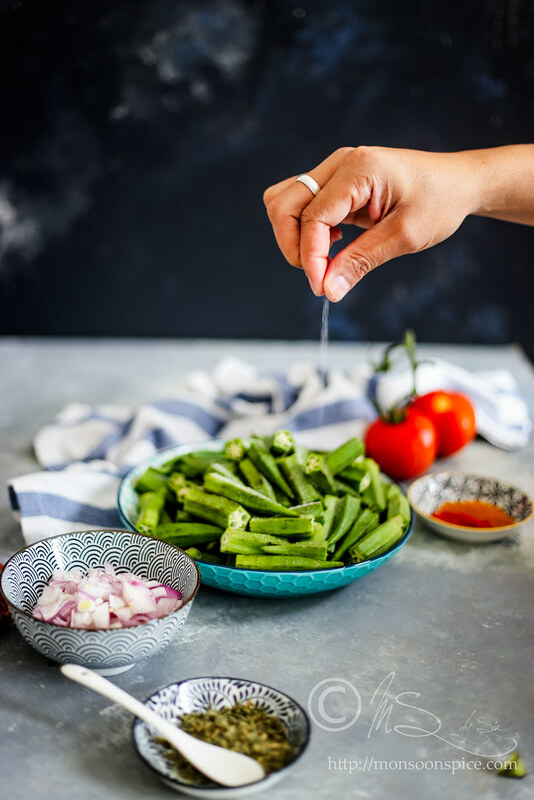 looks fabulous......am bookmarking this to try....we're okra lovers too....but in our excitement to eat it, we pretty much stick to basic recipes!! That is a delight! how lovely, two of my fav things bhindi and yogurt together! oo i can the c the oil on top of t his dish which makes it look yum! great pic sia..very inviting! Ooh! I am a big time okra lover! This looks so yum! Like the new series. All the best. nice recipe..got to try this sometime!! Yep delicious entry, and awesome click!!! i love bhindi. this is totally a new recipe, and i am going to give it a try very soon. the colours look so fresh. love the yellow and green combo. Curry looks as usual delicious. Its a nice combo...all i do is bhindi masala. so is definately must try...thank u Sia. yummy recipe, just tried it yesterday and it turned out great!! i used frozen okra, so it wasn't that crispy, but still turned out great..
My Family of 5 loved this dish & that a very tall compliment. Please accept my congratulations. Next time I will use pureed tomato; it will cook faster and also look smoother. Most importantly my little one will not know she is eating tomatoes!! Sia, I absolutely love your site, happened to tumble over it this morning and tried this recipe. Thanks for the recipe. I cooked this curry as suggested. It was yummy, but didn't turn out to be as creamy as shown in the picture. Next time, I'll probably blend the entire mixture and then add okra. glad you liked the recipe. addition of coconut and cashews should make the gravy thick and creamy. infact i remember adding little extra water in the end to make it thiner. may be it also depends on how thick the curds/yogurt is. you can also saute the onions and grind it instead of using finely chopped ones to get creamy gravy. I always prefer bhindi crisp and dry sauteed. But this gravy was delicious. We loved-loved it :). I am glad to add it to my list of regulars. Thank you for yet another winning recipe, dear Sia. 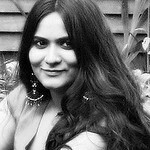 Really it is very interesting..thank you for sharing..we have a website in the name of chennaimoms.com(http://www.chennaimoms.com)..we are going to contect a recipes contest now..if you are intersted you will join and win the prize .. you can share your recipes and suggestion to the moms in chennai..welcome.. Absolutely tasty recipe, I tried out with slight modifications and it turned out very yummy! I tried it .It was came out really well. I tried it. It came out really well. Awesome is the right word for it. This dish is very different and we liked it a lot. Thanks a lot for the wonderful recipe Sia. I love your clicks!! thanks for the lovely recipe. My husband loved it, and we are planning to cook the same for our guests coming over shortly!!! Ah, finally i am able to comment Sia. I just made this yesterday and it turned out really well. My hubby loves ur recipes.. I made this one today and my hubby and I just loved it :-) the coconut n cashew and yogurt makes this gravy mildly spiced which is just the way we like our curries :-) thanks for the recipe! Awesome Awesome recipe. Turned out great. Thankyou so much for posting this. @Asmat Parkar, happy to know that you enjoyed it :) thanks for letting me know. I loved this recipe! It came out amazing! Thanks for the recipe! Will keep making it many more times!!! Tried this for dinner today turned out amazing! Tastes so flavorful! Will keep making it many more times! Thanks for the recipe! I enjoyed eating it as much as I enjoyed cooking it. It was heavenly. My hubby dear was all praises. Next day the gravy tasted even better.I have bookmarked it and will be making it really soon. Amazing recipe, with great flavor.......simple to make too !!!!! Amazingly simple recipe with great flavor. How come the pictures are not displayed anymore? It is so interesting about the “okra slime problem”. Here in Japan, the sliminess is highly appreciated. People here will chop them fine and eat them raw in salad-like dishes to get as much slime as possible. It is believed to be a health benefit. In fact, there is no real word in Japanese that has the exact same meaning as the English “sliminess”. They use a word : “neba-neba” which does NOT HAVE the bad connotation as “slimy” but does point to that condition. America has a dish called Gumbo into which sliced okra are added and the “sliminess” helps to thicken the dish. I wish these was a different way to talk about okra and not use the “S” word as it seems so off-putting. Your recipe is so enticing and the photos look so yummy. I want to try this dish! It looks like a real treat!